Portuguese nobility was the class of legally privileged and titled persons (nobility) acknowledged by the Kingdom of Portugal. During the absolute monarchy, nobles enjoyed the most privileged status and held the most important offices after members of the ruling dynasty and major hierarchs of the Roman Catholic Church. With the introduction of the constitutional monarchy in 1834, the influence of nobles substantially decreased, although the erosion of their power had begun to accelerate from the time of the prime minister, the Marquês de Pombal, in the mid-18th century. 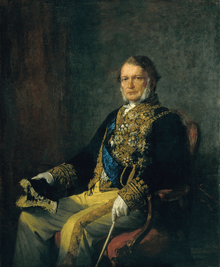 After Portugal became a republic in 1910, some descendants of the nobility continued to bear their families' titles according to standards sustained by the Portuguese Institute of Nobility (Instituto da Nobreza Portuguesa), headed honorarily by Duarte Pio, Duke of Braganza, the pretender to the Portuguese Crown. Portuguese nobility could be traced to the reign of Alfonso VI of Leon, whose reign saw the sons of Leonese nobility become established as gentry in the north of Portugal, between the Minho River and the Douro River. This was the region of the sun and the most powerful men of the kingdom. They united nobility of birth to the authority and prestige of public office. They were followed in the hierarchy, in descending order, by infancies, cavaleiros (knights) and escudeiros (squires). A title of Spanish origin, filho de alguém, applied to senior functionaries and gave rise to the word fidalgo, who, in the 14th century, became widespread and went on to name all of noble lineage, thereby designating the highest class of the nobility, without distinction of rank. By the time of the reign of Manuel I of Portugal (1495-1521), for example, when they were appointed captains of the fleet of Pedro Álvares Cabral, who arrived in Brazil on April 22, 1500, the Portuguese nobility already had registers dating back to the 12th century. The noble members of Cabral's fleet followed this feature, since most descended from families of Castile and León, who had settled in Portugal, who had already rendered several generations of service. The few exceptions - such as Bartolomeu Dias, who received his rank and arms which he transmitted to his descendants - show the importance attributed at this period to the discoveries made. All nobles were considered vassals of the King of Portugal. To rise in status, a noble was expected to demonstrate loyalty and service to the king. The Duke of Saldanha, an example of a powerful post-constitution noble. The Duke of Ávila and Bolama, holder of the only Dukedom (for life) to be granted to a commoner. Though the 15th and 16th centuries were rich in acts of bravery and heroic deeds, the deeds related to the discoveries were not represented symbolically for new arms in Portuguese blazon. Few were granted, and not all heraldic grants were recorded. This did not occur with those involved in combat, especially during the occupation of northern Africa, which feature many coats of arms with their own attributes, such as "Moorish head." 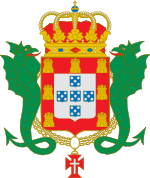 The heraldry of the Discoveries is restricted to inherited symbols from the family, or canting arms, such as Nuno Leitao da Cunha, with nine wedges (cunhas), or the goats of Cabral, without suggesting or representing the challenges found in the sea and its conquest. The arms of Nicolau Coelho, which contain a base undy silver and blue, which can symbolize the conquered sea, is a rare exception. 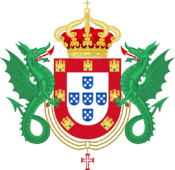 Following the Proclamation of the Portuguese Republic in 1910, the nobility was officially disbanded and ennoblement was prohibited under the Portuguese Constitution. Duarte Nuno, Duke of Braganza, created the Portuguese Council of Nobility during the Republic to study the former monarchy's laws and grants of nobility, and to update the genealogies of ennobled families, maintaining records on the transmission of hereditary titles in accordance therewith. During this time, no new titles were bestowed. The predominant activity of the Council was the identification of living heirs to historical titles. 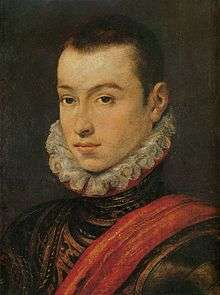 After Dom Duarte Nuno's death, his son Duarte Pio, Duke of Braganza, declared the Council of Nobility disbanded, receiving some criticism for doing so. 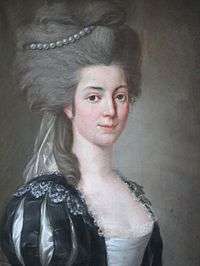 Subsequently, he established what is now called the Instituto da Nobreza Portuguesa, which continues the work and maintains the records of the original Council of Nobility. In Portugal (and Brazil), the honorific Dom (pronounced: [ˈdõ]) is often used for men who belong to the House of Braganza, and for members of families of the titled nobility. Unless ennobling letters patent specifically authorised its use, Dom was not attributed to members of Portugal's untitled nobility: Since hereditary titles in Portugal descended according to primogeniture, the right to the style of Dom was the only apparent distinction between cadets of titled families and members of untitled noble families. ↑ Angus Stevenson, ed. (2007). Shorter Oxford English Dictionary. Volume 1, A – M (Sixth ed.). Oxford, UK: Oxford University Press. p. 737. ISBN 978-0-19-920687-2. 1 2 Tourtchine, Jean-Fred (September 1987). "Le Royaume de Portugal - Empire du Bresil". Cercle d'Etudes des Dynasties Royales Europeenes (CEDRE):. III: 103. ISSN 0764-4426.